Rep. Ben Carpenter walks out of the House Education subcommittee during its March 18, 2019 meeting. House Republicans walked out of today’s meeting of the House budget subcommittee on education, protesting a process that would have required them to publicly support each of the governor’s cuts if they wanted to see them included in the budget. It left three dozen cuts Gov. Michael J. Dunleavy proposed for the Department of Education without any support—and out of the House budget. 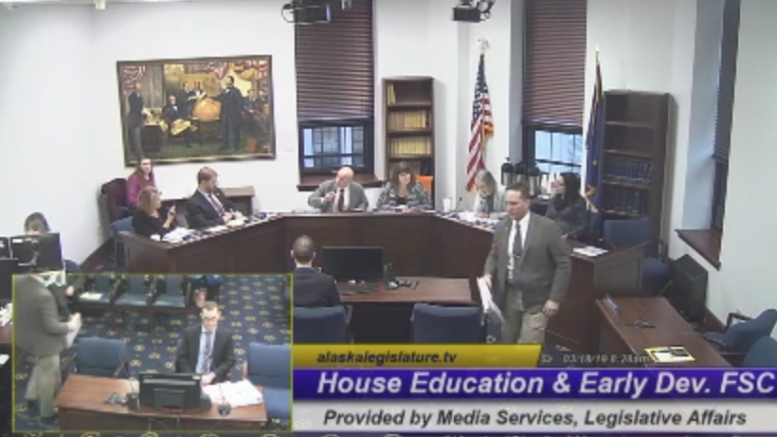 After weeks of informational hearings, the House budget subcommittee on education met this morning to decide piece-by-piece what the parts of the Dunleavy budget would be included in the committee’s recommendations. Those recommendations will be forwarded to the full House Finance Committee where they’ll be rolled into the House version of the operating budget. In the past, the decision on what pieces of a governor’s proposed budget would be included would rest with the subcommittee chair. Budget change documents were traditionally prepared away from public input and typically released as the committee convened. Subcommittee members could then propose amendments on top of those changes. It appeared to be a thoroughly confusing change of process for some of the members, requiring an explanation from legislative finance aide Brodie Anderson before the votes got underway. Anderson said the biggest change in the process was that all items in the governor’s proposal would be put up for a vote instead of allowing a committee chair to pick and choose what’s included. But that explanation wasn’t heard by minority Republican Reps. DeLena Johnson, Ben Carpenter and Josh Revak, who had all already walked out in protest of the process. Revak and Carpenter left during an off-record discussion with subcommittee chair Rep. Dan Ortiz, while Johnson put her protest on the record. Johnson’s comments were made after a lengthy discussion with Ortiz about the upcoming votes, where she argued that the process had been rigged and she had not been given adequate time to review the proposed votes. “As far as I can tell it’s already been predetermined what the votes would be. It’s not amendments, and it’s non-debatable. I’m having a hard time being part of this process,” she said. She also complained about the timing that the documents were provided to the committee: About 3 p.m. on Friday. Again, in the past typically these documents were released at the start of the meeting. “I didn’t have any business days to work on this,” she said. Her lack of understanding of the amendments was reiterated in a statement she released about an hour after the meeting, where she said the amendments would have “increased government spending.” In reality, they would have had the opposite as each change would have accepted a cut proposed by Dunleavy into the budget. If every amendment had been accepted—which was incredibly unlikely given the subcommittee’s political layout—state spending would have been cut by about $17 million, according to the subcommittee’s documents. Instead of holding up-or-down votes on the proposed changes, Independent Rep. Ortiz and the remaining Democrats blew through Dunleavy’s proposed changes with the outcome you might expect. It continued like that through the 36 proposed changes put forward by Dunleavy. A motion to adopt any one of the changes would have brought the proposed change up for a vote by the committee. The lack of changes to the budget means the Department of Education and Early Development’s budget is largely unchanged from the one approved by the Legislature in 2018. Rep. Tiffany Zulkosky, D-Bethel, said she was disappointed in the walkout. “I believe it’s really unfortunate that any representative charged with representing 17,000-18,000 Alaskans would knowingly and willingly step away from that responsibility under a manufactured lack of clarity,” she said. There’s been a lot of debate about how the closeout process will work this year. The subcommittees are taking the adjusted budget prepared by the Legislative Finance Division, which is more or less a status quo budget, and are then deciding which pieces of the Dunleavy budget to include, if any. House Minority Leader Rep. Lance Pruitt, whose wife has a communications contract with the Dunleavy administration, has cried foul on the process. What he doesn’t acknowledge is that this year’s process appears to be essentially what the Republican House and Pruitt employed the last time they were in power. The 2016 closeout produced by the House Department of Commerce, Community and Economic Development subcommittee chaired by Pruitt frequently compares the committee’s proposal to the status quo base budget, treating the former Gov. Bill Walker’s budget as a proposal. The big difference now—other than the governor’s political party—is that the process adopted by this year’s House is that it’s asking legislators to put their support of the governor’s proposals on the record. Had Johnson, Revak and Carpenter stuck around, they would have had to put themselves on the record supporting cuts that have so far proved to be thoroughly unpopular with the public with motions to adopt and subsequent votes. Instead, their walkout allows them to keep any specific cuts at arm’s length. Be the first to comment on "Dunleavy’s proposed education cuts don’t get a chance after minority Republicans walk out of committee"